This summer I became extremely spoiled by access to a fabulous farmers market. The neighborhood that I was lucky enough to temporarily call home also happens to have a large and fairly famous farmers market. This meant that the majority of my groceries from the week were fresh fruits and vegetables straight from the farmers – a huge treat. Every saturday I would go and make the rounds, sometimes after brunch and a trip to the library, sometimes directly there. I do feel bad for all the friends who I dragged along with me over the last few months, as I tend to get extremely (over)focused while doing grocery shopping. I literally mean that I don’t want to talk to anyone or think about anything else, I just want to be totally present and focused on picking out vegetables. Over the course of the summer I developed a routine: the same place for tomatoes, one for lettuce (all kinds of crazy varieties – sorrel, purselaine..), one for peaches, one for apples and on and on. So a big thank you is owed to all those who put up with this madness. This dish is inspired by summer farmer’s market bounty – namely gorgeous summer tomatoes and tender eggplant. I would suggest trying eggplants of all varieties – from dark purple to lavender to white – no fear. Enjoy! 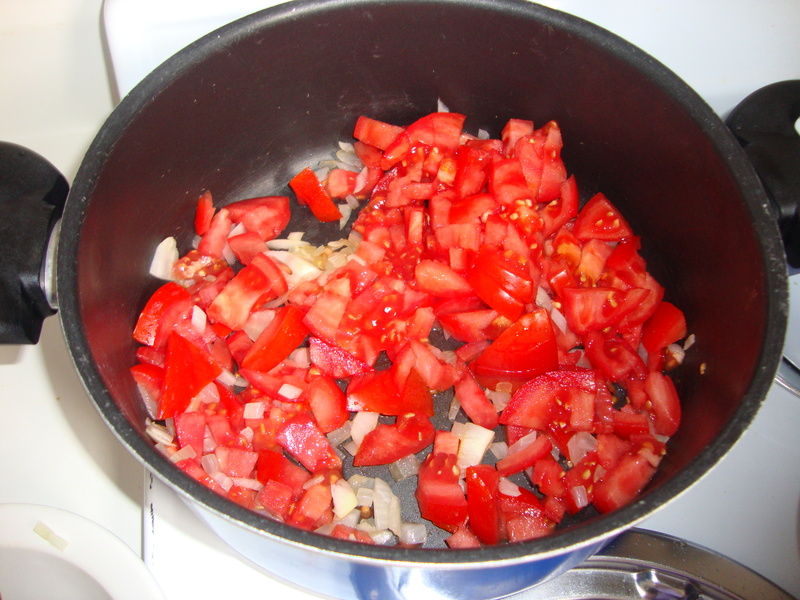 if you don’t have good fresh tomatoes, use one can of diced tomatoes. Bring your large pot to medium low heat, add the olive oil. Dice your onion finely and add to the pot. Cook for about 20 minutes on low heat until the onions are soft and translucent. 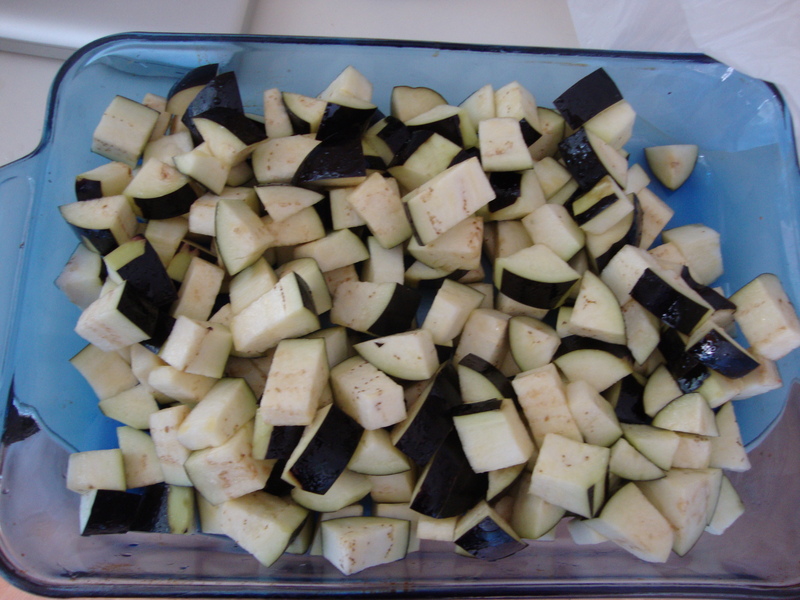 Wash your eggplants and use a peeler to peel off some of the skin in stripes. Cut them into one inch cubes and throw them into a bowl of salty water. The eggplant will float, so I usually put another bowl full of water on top of them to weigh them down. Let them soak in this water for 20-30 minutes, this will help to draw out the bitterness (you’ll notice that the water turns brown). Chop your tomatoes and add them to the onion. Let them cook slowly, until they are nice and soft and don’t taste raw. 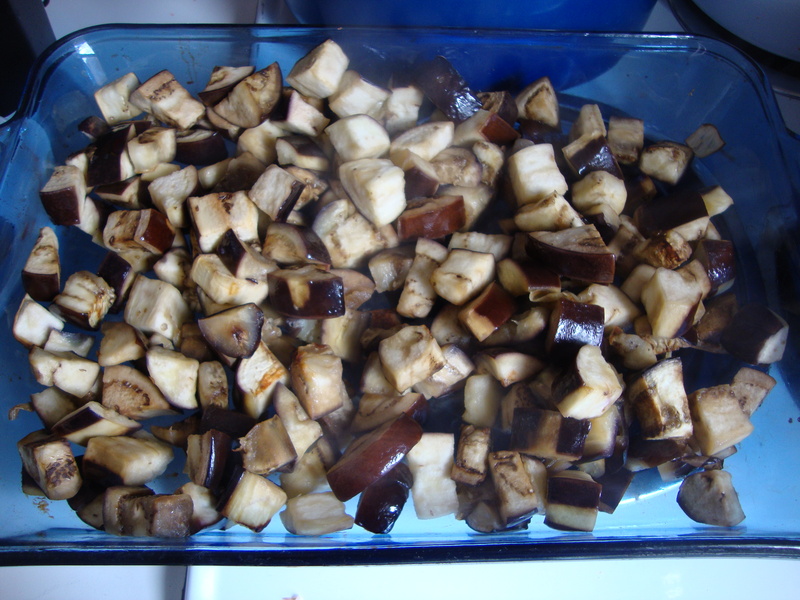 After the eggplant has finished soaking, drain the water and dry them off gently with a towel. Place into a bowl with about a table spoon of olive oil and give them a good toss so they are well coated. Layer in an oven safe pan and place into the oven. Give them a mix about every ten minutes until they are well roasted and tender. 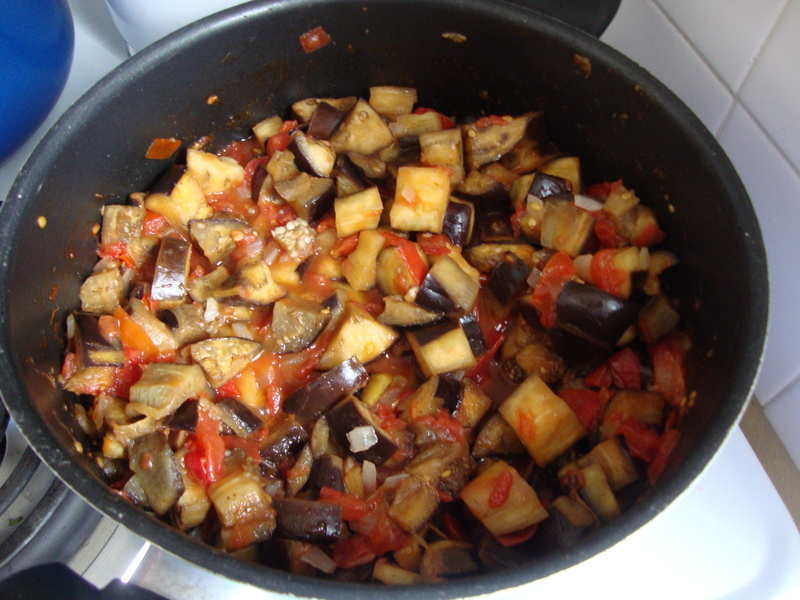 Once the eggplant are ready, add them to the tomatoes. Let them cook through until fully tender. Season with salt, pepper and cumin. Once to your liking, serve warm with rice or bulgur or cold as a side dish!